Israel does not trust Iran just as Pakistan does not trust India. While Israel is preparing for eventual nuclear-armed Iran in the future, Pakistan is threatened by India's growing nuclear triad and atomic arsenal today. So what are Israel and Pakistan doing to deter potential nuclear attacks by their regional rivals? They are both building sea-based nuclear second strike capability with diesel-electric submarines equipped with air-independent propulsion (AIP). Israel has just taken delivery of the 5th of 6 Dolphin II class AIP-equipped submarines built by Germany. More than 225 feet long, the diesel-electric Dolphin II class is part attack submarine, part nuclear strike ship and part commando taxi. Each sub has 10 tubes. Four of these tubes are larger 26-inch tubes—the size is rare for a Western-built submarine—capable of launching small commando teams or firing larger nuclear-capable cruise missiles. The remaining six tubes measure at 21 inches, according to Real Clear Defense. Several German defense ministry officials interviewed by German news magazine Der Spiegel believe that Israel intends for these submarines to carry nuclear weapons. The missiles can also be launched “using a previously secret hydraulic ejection system,” the magazine reported. A key requirement for submarines is to be stealthy—and the Dolphin II is indeed very quiet. The trick is in the submarine’s air-independent propulsion fuel cells, which provide power under the surface as the diesel engines—used for running on the surface—rest and recharge. This system is quieter than the nuclear-powered engines on American and Russian submarines, which must constantly circulate engine coolant. Nuclear submarines are virtually unlimited in terms of range, and are better used for deep-water operations. But Israel has no need for nuclear-powered subs when quiet diesel subs can do the same job, according to Real Clear Defense. The details of Pakistan's planned submarine fleet are not clear yet. However, Pakistan too is acquiring a fleet of AIP-equipped diesel-electric submarines. Pakistan Navy operates a fleet of five diesel-electric submarines and three MG110 miniature submarines (SSI). The nucleus of the fleet includes two Agosta-70 and three modern Agosta-90B submarines. Pakistan's third Agosta-90B, the S 139 Hamza, was constructed indigenously and features the DCNS MESMA (Module d'EnergieSous-Marin Autonome) air-independent propulsion (AIP) system. Pakistan retrofitted the two earlier Agosta-90B vessels with the MESMA AIP propulsion system when they underwent overhaul in 2011, according to Nuclear Threat Initiative. Pakistan is expanding and modernizing its underwater fleet with 8 additional AIP-equipped submarines ordered from China. Whether the Chinese submarines are the S-20 export derivative of the Type-039A/Type-041 Yuan-class submarine, or a bespoke design, is unclear. But the Yuan has also been mentioned, and according to government officials. If the deal transpires, it will be the largest ever Sino-Pakistani deal. Mansoor Ahmed of Quaid-e-Azam University's Department of Defense and Strategic Studies, believes the submarines will each cost $ 250 million to $325 million. Mansoor Ahmed told Defense News that AIP-equipped conventional submarines "provide reliable second strike platforms, [and] an assured capability resides with [nuclear-powered attack and nuclear-powered ballistic missile submarines], which are technically very complex and challenging to construct and operate compared to SSKs, and also very capital intensive." Isn't Pakistan has more nuclear arsenal than India and the numbers are further going up? Then how come Pak is threatened by India's "growing" nukes? India has "No First Use" policy on nukes while Pak is ready to battle it out with her tactical nukes. Isn't the very first sentence of the article is foxy? India has combined threat from China and Pakistan, both nations being defence and strategic partners and both having territorial disputes with India. Any balance of power should weigh India on one side and China-Pak on the other. Any assumption of balance of power with with only Pakistan will grossly undermine India's security. Pakistan can not be equated with India in terms of area, population, economy or defence and hence there can not be balance of power. The article ends suggesting that covert and proxy wars are a result of lack of diplomatic effort. But Pakistan's proxy war on India using terror is an overt as well as covert state strategy and nothing to do with dialogues and diplomacy. Singh: " India has "No First Use" policy on nukes while Pak is ready to battle it out with her tactical nukes. Isn't the very first sentence of the article is foxy?" India's NFU is not worth the paper it's written on. Past track record of India shows it can not be trusted by any of its neighbors, including Pakistan. Teaching Akhand Bharat and huge arms imports are just the tip of the iceberg of India's ambitions. Both Israel and Pakistan have decided to field tactical nuclear weapons aboard their small flotillas of diesel-electric submarines. While Pakistan is a declared nuclear power and Israel has opted to pursue a policy of nuclear ambiguity for the past four decades, both nations’ military thinkers echo each other in their frequent referrals to the sea as a source of strategic depth. This shared emphasis stems, in large part, from their growing sense of continental claustrophia. Both countries are territorially shallow, and resulting sentiments of vulnerability have helped shape and sustain already potent senses of embattlement. For strategists in Jerusalem, apprehensions over the widening demographic divide between Israel and its more populous Arab neighbors has been compounded by the severe political turmoil and uncertainty in the wider Middle East. In particular, there is growing concern that further waves of upheaval in the Arab world could produce a regional climate more staunchly hostile to Israeli interests. In addition to the potential existential threat posed by a nuclear-armed Iran, Israeli planners must also confront a rapidly changing conventional military environment – one in which the shallowness of Israeli territory increasingly acts as a major liability. Whereas in earlier years Israel’s very compactness generated certain operational benefits — by enabling its armed forces to maneuver with fluidity within interior lines – the diffusion of precision guided munitions (PGMs) and precision strike systems amongst Israel’s prospective antagonists has largely negated any such advantage. Hybrid and non-state actors such as Hamas and Hezbollah increasingly have the aptitude to “see deep and shoot deep,” while Iran continues to acquire a bristling array of ballistic missiles aimed at Israel. The Israeli Defense Force’s stationary bases and airfields are thus increasingly exposed to missile attacks. Hezbollah, for instance, is estimated to be sitting on a steadily growing stockpile of more than 40,000 rockets and missiles. In previous conflicts, Israel could rely on its command of the skies as a means of offsetting its numerically superior foes. In the long run though, the difficulties inherent in prosecuting hybrid actors concealed within crowded urban environments, along with the densification of cheaper and more capable anti-aircraft systems, are liable to impede the Israeli Air Force’s freedom of action. In sum, Israel’s continental exiguity acts as a growing constraint on its ability to guarantee the safety of its citizens from both conventional and nuclear attack. The S-20 SSK was first offered at the IDEX 2013 arms show in the UAE; it is a quiet 2,600 SSK capable of firing cruise missiles and torpedoes, in addition to inserting special forces and mines. 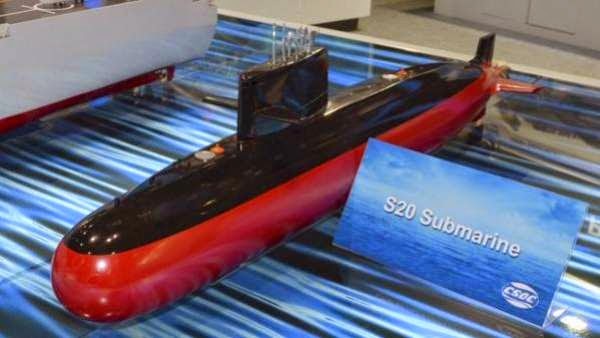 Pakistan's Chinese subs are likely to be based off the S-20 design. On March 31st, Pakistan announced plans to buy eight new Chinese-made submarines. The submarines are likely to be based of the Type 39B Yuan SSK, of which the export version is designated the S-20. The S-20 displaces about 2,300 tons, but air independent propulsion (AIP) is not standard to the submarine. AIP a closed off propulsion system, like a gas compression Stirling engine or fuel cells, that doesn't require a separate oxygen supply It is a must have for modern SSKs, allowing them to stay underwater for up to four weeks without using noisy snorkels to recharge batteries (often SSK batteries have enough charge to last several days at most). Pakistan's S-20s are likely to have AIP since its Agosta 90B submarines already have the technology; the PLAN's 12 Yuan SSKs all have sophisticated AIP systems. The Type 039C Yuan SSK is the latest Chinese conventional submarine, launched in 2014. It features a redesigned conning tower, as well as better sonar. The Yuan class's AIP system makes it China's most capable conventional submarines. The significance of the plan is that it Pakistan badly needs to modernize and expand its submarine fleet, especially given rival India's acquisition of domestic, French and Russian conventional and nuclear submarines. Overall, Pakistan's 2015 naval plan calls for twelve submarines. The Pakistani Navy currently operates five French Agosta submarines, with two of its Agosta 70s 40 years old and in need of replacement soon. The Babur LACM has a range of 750-1000km, and is equipped for both conventional and nuclear attack. It is likely that it will form the basis of a submarine launched LACM, potentially giving Pakistan an underwater second strike nuclear capability. The other important features of the S-20 purchase stems from its weaponry and its effect on regional balances of power. The S-20 has a standard load of six torpedo tubes, able to fire up to 18 torpedoes and missile canisters, which include the 533mm Yu-6 heavy torpedo, naval mines and 300km range YJ-82 anti-ship missile. Such capabilities could prove quite important in any conventional war scenario in the region. In addition, Pakistan is working to modify its nuclear capable Babur land attack cruise missile for launch from its current Agosta 90B submarines, so the new S-20s would almost certainly also be designed to carry nuclear armed Babur missiles. In addition to being able to launch nuclear strikes from previously inaccessible areas like the Bay of Bengal, an underwater nuclear deterrent would finally give Islamabad a credible second strike capability. ..former top German officials have admitted to the nuclear dimension for the first time. "I assumed from the very beginning that the submarines were supposed to be nuclear-capable," says Hans Rühle, the head of the planning staff at the German Defense Ministry in the late 1980s. Lothar Rühl, a former state secretary in the Defense Ministry, says that he never doubted that "Israel stationed nuclear weapons on the ships." And Wolfgang Ruppelt, the director of arms procurement at the Defense Ministry during the key phase, admits that it was immediately clear to him that the Israelis wanted the ships "as carriers for weapons of the sort that a small country like Israel cannot station on land." Top German officials speaking under the protection of anonymity were even more forthcoming. "From the beginning, the boats were primarily used for the purposes of nuclear capability," says one ministry official with knowledge of the matter. Insiders say that the Israeli defense technology company Rafael built the missiles for the nuclear weapons option. Apparently it involves a further development of cruise missiles of the Popeye Turbo SLCM type, which are supposed to have a range of around 1,500 kilometers (940 miles) and which could reach Iran with a warhead weighing up to 200 kilograms (440 pounds). The nuclear payload comes from the Negev Desert, where Israel has operated a reactor and an underground plutonium separation plant in Dimona since the 1960s. The question of how developed the Israeli cruise missiles are is a matter of debate. Their development is a complex project, and the missiles' only public manifestation was a single test that the Israelis conducted off the coast of Sri Lanka. The submarines are the military response to the threat in a region "where there is no mercy for the weak," Defense Minister Ehud Barak says. They are an insurance policy against the Israelis' fundamental fear that "the Arabs could slaughter us tomorrow," as David Ben-Gurion, the founder of the State of Israel, once said. "We shall never again be led as lambs to the slaughter," was the lesson Ben-Gurion and others drew from Auschwitz. Armed with nuclear weapons, the submarines are a signal to any enemy that the Jewish state itself would not be totally defenseless in the event of a nuclear attack, but could strike back with the ultimate weapon of retaliation. The submarines are "a way of guaranteeing that the enemy will not be tempted to strike pre-emptively with non-conventional weapons and get away scot-free," as Israeli Admiral Avraham Botzer puts it. Hardly a week after the Iran deal was announced, the New York Times — which often reflects official US policy — editorially propagated that attention be turned to constraining Pakistan’s nuclear and strategic capabilities. The issue was also covered by other US media. The world should be made to understand why Pakistan remains ‘obsessed’ with India. If Pakistan then ‘violates’ such restrictions, it would be subjected to multilateral or unilateral sanctions. — Pakistan is descending into chaos. These motivated assertions need to be refuted effectively. Pakistan’s diplomacy should be actively mobilised for the purpose. Unlike Iran, Pakistan doesn't call for Israel's destruction. But in certain ways, Islamabad poses more of a threat to Israel than Tehran does. Yet in March, Pakistan test-fired a nuclear-capable ballistic missile, the Shaheen III, which Pakistani officials said can reach Israel. This event was barely noticed in Jerusalem. In view of the disturbing nuclear developments in Pakistan as well as in North Korea and Russia, the hysteria expressed by prominent Israeli politicians and journalists over the recent draft agreement with Iran is unwarranted. The threat posed to India, South Korea, Poland and the Baltic states from their nuclear-armed neighbors is arguably at least as great as that which Israel is facing from Iran. Regular warnings are sounded in Israel about the dangers facing the world from nuclear terrorism once Iran obtains a nuclear weapon, but is this not a case of locking the stable door after the horse has bolted? The threat of nuclear terrorism has existed since the collapse of the Soviet Union and has grown significantly as Pakistan has cemented its status as a nuclear weapons state. Indeed, one could argue that Islamabad poses more of a threat to Israel than Tehran does. After all, we cannot be certain that Iran will take the next step and acquire a nuclear weapon, but Pakistan already possesses over 100 nuclear warheads. It is understandable why this is rarely discussed in Israel: Though Pakistan is the first Muslim state with a nuclear weapons program, it does not call for Israel’s destruction or sponsor terror attacks against Israel. A nuclear Iran, by contrast, would receive cover to step up its hegemonic ambitions in the region and intensify its support for terrorism against the Jewish state. In addition, Pakistan has taken measures in recent years to strengthen oversight for its nuclear facilities and has dismantled proliferation networks. And even if Pakistan were to disintegrate tomorrow, it would be India, not Israel, that would be first in line to face Islamabad’s nuclear warheads, whereas Israel would certainly believe itself to be the first potential target of a nuclear Iran. But despite Islamabad’s obsession with India, Pakistani officials have also spoken on occasion about the need to deter Israel. And were Pakistan to disintegrate, it could pose an imminent threat not only to India but also to the Middle East, including Israel. During his first term in office, U.S. President Barack Obama reportedly told his staff that the possible breakup of Pakistan and the subsequent danger of a scramble for nuclear weapons was his greatest national security concern. Indeed, terrorists have tried on several occasions to assassinate the former president of Pakistan, Pervez Musharraf. In such circumstances, Pakistan’s nuclear weapons could be stolen or smuggled out of the country, with the possibility of rogue elements targeting Israel. Indian Warship INS Khukhri was sunk by a Pakistani sub. Ghazi was sunk in a mine-laying accident, not by enemy. Indian Navy stayed away from Karachi after the sinking of INS Khukri which was the heaviest loss of life in a single incident in the entire war in which 18 Indian Navy officers and 178 sailors perished. Rishi Raj Sood, captain of INS Kirpan - which was accompanying Khukri, fled the scene. “We were hoping that Kirpan, our sister ship would come to rescue us but we saw her sailing away from the area”, Commander Manu Sharma, a survivor of Khukri, has been quoted by Cardozo as having said. This is not necessarily a harbinger of strengthening ties between Saudi Arabia and Israel. But it indicates how Saudi Arabia and the region are changing. The Saudi delegation was led by a retired general, Anwar Eshki (now chairman of the Middle East Center for Strategic and Legal Studies, a think tank in Jeddah) and included academics and business executives. They met with Mahmoud Abbas in Ramallah and attended meetings with Israeli Knesset members. Perhaps most significant, the Saudis met with Dore Gold, the director general of Israel’s Foreign Ministry, and Maj. Gen. Yoav Mordechai, Israel’s coordinator of activities for its territories. Mr. Gold and Mr. Eshki have met before. And non-governmental ​meetings between Israelis and Saudis in academic and policy forums are fairly common. Prince Turki bin Faisal, former Saudi ambassador to the U.S. published a column in a leading Israeli newspaper in 2014 arguing for the 2002 Arab Peace Initiative. I participated in a panel in Washington that year that included Prince Turki and Yossi Alpher, a former Mossad official. In the 1990s, during the heyday of the peace process, Israelis and Saudis met frequently in the course of multilateral forums. Th​is​ visit reflects far more ​change in​ Saudi views than those in Israel. The Jewish state has long pressed for normalization with the Arab states, particularly those in the Gulf. Such a public visit suggests Saudi willingness to test the waters. Changes in the region wrought by the Arab Spring, the rise of Iran, and shared worries over the Iran nuclear agreement have narrowed the divide between Saudi Arabia and Israel. The Saudis appear to be more worried about Iran and the rise of ISIS than about being seen with the Israelis. The logic of shared enemies has created more intimacy in Israeli-Egyptian relations as well. Egypt and Israel both have interest in restraining Hamas and the jihadis operating in Sinai. What’s striking is that Saudi Arabia and Egypt seem to be using the Palestinian issue not to isolate Israel but as a basis to engage. In recent days photographers in the area, near Las Vegas, have filmed Israeli, Spanish and Pakistani aircraft in advance of the joint exercise. In addition, a transport plane belonging to the United Arab Emirates was also photographed, indicating that, as reported, that country’s air force will also participate in the exercise. The Israeli plane that will be used in the exercise is the F-16I (the “Sufa,” or Storm). In footage from Nevada one can see that IAF jets belonging to three different Sufa squadrons were sent to the United States. Air and ground crews will also participate. The Red Flag exercise is scheduled to end on August 26. “The Red Flag is the biggest and best simulation of war in the world,” one IAF officer said at the end of the 2015 exercise. All of the squadrons participating are assigned to “red” and “blue” forces. They practice intercepting other aircraft, attacking targets, rescuing pilots and engaging in aerial activity under the ostensible threat of ground-to-air missiles. Haaretz received no response when questioning Israel Defense Forces sources two weeks ago about the possible participation of Pakistan and the UAR in Red Flag. NELLIS AIR FORCE BASE, Nev. (AFNS) -- Pakistan Air Force F-16C/D aircraft traveled more than 7,700 miles to participate in Red Flag 16-4 here from Aug. 15-26. Pakistan brought a unique set of skills to the exercise, from their willingness to collaborate to their motivation to get the most out of the training scenarios. Not only have the Pakistan pilots been impressive but also their maintenance team as well. Integration has been a major focus for Red Flag 16-4 and the Pakistan Air Force has played a key role in helping achieve that goal. “When you have a force that is that professional and is dedicated to training and working together as a coalition you are going to get better as a group and I think that has been the biggest lesson from this,” Mattson said. The exercise has helped both air forces learn each other’s strengths and utilizing those strengths in real-world situations. The Pakistan Navy (PN) has set up a new maritime force known as Task Force-88 (TF-88) to protect sea lanes linked to the China-Pakistan Economic Corridor (CPEC), which is expected to trigger a surge in maritime activity at the country's Gwadar Port on the Arabian Sea. The new task force, which will reportedly comprise naval vessels, manned and unmanned aircraft, and other surveillance assets, was established on 13 December "for [the] maritime security of Gwadar Port and [the] protection of associated sea lanes against both conventional and non-traditional threats", according to a DAWN newspaper report. Marines are also set to be deployed at sea and around the port to enhance security, a senior PN official was quoted by the paper as saying.